So now that you have seen the incredible results of lash extensions, we want you to know a few eyelash extension facts to make the most out of your beauty investment. 1. Eyelash extensions are not “one size fits all”. Everyone’s lashes are different and eyelash extensions should be customized to each individual for the correct length and thickness to suit their look and ensure the health of their natural lashes. Not everyone can or should get super long or super thick eyelash extensions! 2. A full set of eyelash extensions is not all one length. The shape of your lash line tapers – it’s longer in the center and shorter on the outsides and your extensions should be too. Following the design of the natural lashes creates natural-looking extensions! 3. Natural lashes grow to a finite length (different for each person), fall out and are replaced by new growth, just like the hairs on your head. When eyelash extensions are applied and maintained correctly, they will grow out with your natural lash and still be attached to the lash when it sheds. 4. Natural lashes are constantly growing in and falling out at different times so your eyelash extensions will too! There is no set amount of time that eyelash extensions will last because they will shed with the natural lash they are attached to when it grows out and that time varies. Due to growth cycles and different stages, the best estimate is that you will shed 1-5 natural lashes per day – including those with extensions and those without. Frequent re-lashes will replace those that have shed to maintain a full look. 5. You SHOULD be seeing your natural lashes and extensions fall out together. This is normal. If your extensions fall off before the natural lash, the adhesive bond wasn’t strong enough or maintenance instructions were not followed correctly. 6. You CAN wear makeup with eyelash extensions but it has to be formulated for compatibility. Xtreme Lashes® offers a full line of cosmetics and skin care specifically designed for eyelash extensions. 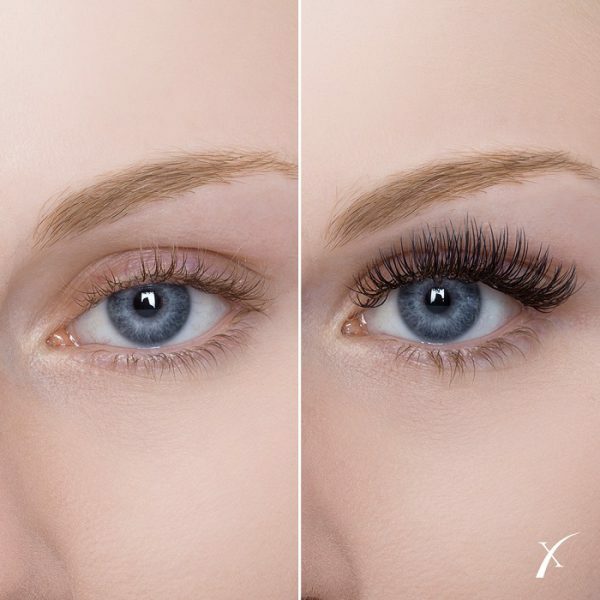 Ask your Xtreme Lashes Lash Stylist about these products or shop online. 7. Eyelash extension adhesive is designed to create a permanent bond between the extension and the natural lash. It is nearly impossible to remove extensions yourself without damaging your natural lashes. See a professional if you need removal! Ready to give eyelash extensions a try? Find a trained and certified professional Lash Stylist on the Xtreme Lashes website! Thank you for the comment! To answer your question, eyelash extensions (like natural lashes) are tapered at the tip. Cutting off the extensions results in a blunt tip that looks very unnatural. In addition, there are reasons that could cause someone to want removal early such as a poor application where multiple lashes are adhered together. In this case, the adhesive actually needs to be removed and not just the lash. Xcellent question – please let us know if you have any others.